THE HOUSE SCIENCE COMMITTEE HATES SCIENCE AND SHOULD BE DISBANDED | "Global Possibilities"
As if named by a Congressional Office of Dark Irony, The House Committee on Science, Space, and Technology really seems to hate science. 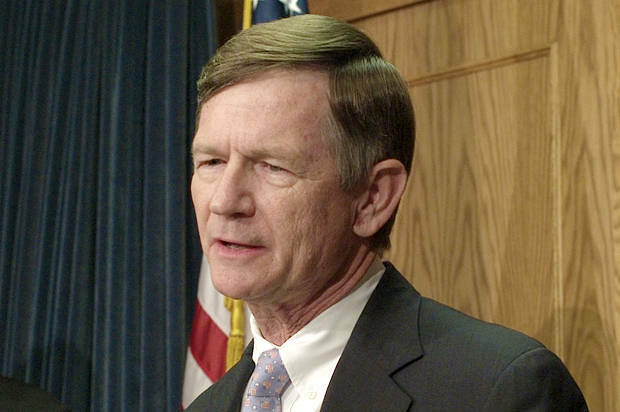 Its current chair, Lamar Smith, R – Tex., is a climate change denier, seeing a conspiracy in the overwhelming scientific consensus on human-caused global warming, where the vast majority of experts in the world see only good science. In the last four or five Congressional sessions, the attacks on science made by the majority membership of HCSST have become increasingly unhinged and prolonged. Rather than acting on House Resolutions that advanced the aims of science, Lamar Smith assumed the role of small-government gadfly, irritating and exhausting scientific administrators like NSF Director France Córdova, over whose agencies HCSST had some purview. To a scientist, these sound like questions that most likely merit long and complicated answers. The theoretical judgments of expert reviewers for granting agencies are based on arcane information not open to casual inspection. Any non-scientist with a touch of humility might understand that. After all, there are many far simpler things that non-scientists are not expected to know, like what causes the wind or what keeps water in the toilet bowl. Whatever hubris underlies Smith’s meddling in cherished scientific practices like peer review, we should make sure that the NSF’s appropriations request is not being singled out for higher standards of accountability than are shown by the legislators themselves. How are expenditures justified in other bills? Lamar Smith voted in favor of the Farm Bill. How would he justify the Farm Bill’s public taxation for a $15 million ‘wool trust fund,’ a $170 million program to protect catfish growers from overseas competition, a $3 million tax bill to promote Christmas trees, and a nice, round $100 million to study how to get Americans to buy more maple syrup? Smith announced the federally funded NSF’s responsibility to taxpayers to only fund research that will benefit U.S. citizens in a concrete way in the immediate future. This is an image of science unfamiliar to anyone who actually does it. If we embraced it, we would all be doing the genetics of corn. No one has ever been able to reliably predict the future of science. But fund research that pursues ideas identified by experts as theoretically promising, and the unanticipated benefits flow. To take just one example: Who would have guessed that a theoretical model of our mental lexicon introduced by psychologists of language (an area of NSF targeted for cuts by HCSST) would be used by the U.S. Adopted Names Council to reduce “sound-alike” prescription errors, like when a pharmacist accidentally prescribes Keppra, an anti-seizure medication, instead of Kaletra, an HIV antiviral medication, and thus avoid thousands of accidental deaths and illnesses? Nobel Prizes winners in Economics have done research supported by the Social, Behavioral, and Economic Sciences (SBE) directorate of the National Science Foundation, but Smith looked to gut SBE nevertheless. He then scrutinized selected activities at the Department of Energy. There, Smith has been focusing the power of the Committee, such as it is, on activities that don’t seem very closely related to scientific oversight. Recently, he sent Republican members to scrutinize the Environmental Protection Agency’s considered scientific judgments (about the EPA’s Pebble Mine safety concerns over a gold-copper-molybdenum strip mine in Alaska), for example, Smith offered his presumably scientific opinion that “This is harmful to economic development and dangerous to the democratic process.” Under its charge to monitor the administration of many government offices, the Committee has badgered the IRS about the security of their Internet and email systems, and insinuated in public settings that the IRS is in violation of standards, and defiantly non-compliant. In each of these cases, the charge of the Committee was used by Smith to advance Republican aims and to criticize or frustrate Democratic initiatives. It is not merely that the Committee has lost its way under the chairmanship of Smith; rather, it has no real way forward in the first place. Hastily assembled in 1958 in response to Sputnik’s launch, the House Committee on Science, Space, and Technology has changed its name and reach no less than six times. This titular drift signals the Committee’s unprincipled vacillation in charge. The biggest problem, and the best publicized, is that powerful and longstanding members of the Committee have a contempt for science. This contempt is most potent when combined with an arrogance that renders them too ignorant to know when to defer to experts. On March 26, 2014, the HCSST met with the president’s chief science advisor, John Holdren, to complain that current science-based initiatives to slow global warming conflicted with their own individual understandings of the issues. As one member (of the Committee on Science, Space, and Technology, you recall) put it, it just didn’t make sense to say that people were causing global warming. After all, the earth had warmed up between the ice ages when there were no people around, so how could we blame humans for the current warming? “Just because we’re alive now,” he reasoned, “the tectonic plate shifts aren’t gonna stop, the hurricanes [and] tsunamis aren’t gonna stop, the asteroid strikes aren’t gonna stop.” These are—at best—uninformed, gut reactions. And these initiates are quick to substitute scientific testimony with their own intuitions. This pattern of hostility toward and ignorance of science on HCSST has a long history. Immediately preceding Chair Lamar Smith was Chair Ralph Hall, R-Tex., whose own background in science is uncertain. What is certain is that he was born shortly after the discovery of penicillin and finished any college coursework before the discovery of DNA. Yet as chair he published an op-ed in the Washington Post in 2012, chiding the EPA for their “poor science.” No one knows where he acquired the scientific expertise to form that judgment. Maybe he got a science refresher from one of the science panels routinely contracted by the Committee. But that seems unlikely, because Committee members are evidently not required to attend those sessions. The procedures by which the Committee approaches these obscure and arcane scientific issues are also utterly nontransparent to the ordinary citizen. A Committee staff person with whom I spoke would not say who attended educational sessions, fell silent at the question of whether attendance was required, and would not discuss anything relevant to the House resolutions before them without special clearance. This nontransparency is ironic, because this is the feature that U.S. policymakers object to when they criticize administrative approaches to science policy used in England and France – in which scientists rather than legislators make the science policy. This is not a problem with Ralph Hall, or with Lamar Smith. It is a problem with the way we play at democratic decision-making about science. Although we know that we want the lights to go on and our pipes to hold water, there is a reason that we don’t demand detailed, transparent descriptions from our electrician and plumber: We don’t have the knowledge to evaluate their explanations of circuitry or of vapor lock in pipes. The same goes for accountability in science. It is fine to ask scientists to explain their research to the public, but we cannot demand that they persuade that public of its significance; the public simply hasn’t the expertise to make those evaluations, and it isn’t the government’s job to patronize them about that. Although the Committee has cost the U.S. taxpayers many millions of dollars in resources and person hours and opportunity costs, as the institutions of science fended off these ludicrous intrusions on the efficient administration of good science, its ineffectiveness as a law-making body has also limited its damage. So perhaps we should be grateful that, between 2005 and 2011, 743 bills came before the HCSST, and by my count 21 became law. Given its cost in both knowledge and treasure, the HCSST could end tomorrow and leave only freed-up resources and a welcome quiet. House committees are rarely disbanded but, as we have seen, often renamed. The House Committee on Science, Space, and Technology has little to do with science anymore, if it ever did. Science is too arcane for initiates to judge technical issues underlying processes like ocean acidification, gene-splicing and disposal of dangerous chemicals, and it is not government’s job to sustain the illusion that they can. This is especially so when the loudest climate change deniers rely on fossil fuel companies to fund their reelections. These battles, then, have nothing to do with intelligent persuasion or scientific evidence. And there is no reason to think it will ever change. Explanations for the Committee’s internal battles and ineffectiveness abound. At a recent policy conference I attended, employees at two different lobbying organizations told me, over drinks, that HCSST got nothing done because its members were known by Beltway insiders as “dim bulbs.” But that is too glib an explanation for the Committee’s profound dysfunction. As electricians say (or at least they should), “It’s not the wattage that matters; it’s the schematic.” A blueprint for this Committee should dub procedures that remove opportunities for conflict and corruption, procedures that prevent members from pursuing investigations based on suspicions that would not themselves pass peer review. Some optimists might look to a more systematic method of citizen oversight. Voters need to know how untutored politicians on HCSST get advised and whether they show up for expert panels and educate themselves before deciding on a policy. Citizens need evidence that there is a political price to pay for dishonesty; the House should make the misrepresentation of scientific results a sanctionable or otherwise punishable offense. But until this committee learns how to compel responsible behavior from its members, science will continue to be used cynically by members who want to generate campaign funds and whip up the voting base. And that is why HCSST is no longer viable. This is too much oversight; too much babysitting to control mischief. And House rules won’t compel it. Members will vote their private interests, they will vote their constituencies, they will vote their campaign funders, they will vote their aspiration to rotate into a K Street lobbying position. What’s more, even if you could control conflict and corruption, you can’t make people respect science. With dysfunctions so costly, rampant and chronic, it is time for the HCSST to pack up its tent, a rare event for a standing committee. But its troubles are that serious. If this assessment seems harsh, I defer to Scientific American, hardly a partisan magazine, which has called HCSST’s anti-scientific antics “a national embarrassment.” The U.S. should be embarrassed by a Sputnik-driven science committee now ironically reminiscent of Lysenkoism in Communist Russia, making judgments of “scientific fitness” based on partisan political expediencies. When the national embarrassment is a standing committee of the House of Representatives, disbanding it would require a bill coming before the House floor, and then receiving a majority vote. Though rare, it has occurred. And there are other options available to end the madness but not the committee. But these procedures must be dusted off. Science has a promising future, even if the HCSST doesn’t. The trick will be to use procedures of oversight that are as successful as science itself. There is a science of judgment that can help people, including legislators, make better decisions. In fact, it is one of the great ironies of modern policy-making that legislators use their gut reactions and horse sense to judge issues in psychological science and behavioral economics that have proved the unreliability of our gut reactions and horse sense. The main science body in the House shrugs off core scientific findings. Members misrepresent the contents of science bills. They ignore conflicts by taking campaign money from industries standing to benefit from their vote. The last two chairs have created a calendar of Committee activities based on imagined global and domestic conspiracies. No one is happy about this. Not the Committee. Not the American public. And especially not the science agencies of this Democratic administration. HCSST has become a sad, partisan pantomime of what science governance could be in an advanced democracy. The most sensible alternative is the European model of administrative law, in which Congress empanels experts, not legislators, to make science-related law. But that would be a challenge for the next administration.